Kristin Williams skiing powder in Faro trees in Vail’s Game Creek Bowl on Saturday, Jan. 13 (David O. Williams photo). On Saturday, Jan. 6, Vail was still waiting. Looking to the heavens and collectively muttering snow prayers and incantations cajoling the Snow Gods to please deliver some significant flakes to salvage what so far had been the driest start to a ski season in at least 30 years. Then nine inches fell overnight. Then another five during the week. Then another 10 at the end of the week. And lo and behold, we finally had a ski season — albeit one that very inconveniently started after the critical holiday period. My heart (and wallet) goes out to all the local merchants who were short-changed by Mother Nature (I will always shop and dine locally when possible in the Vail Valley … trying to do my very small part). 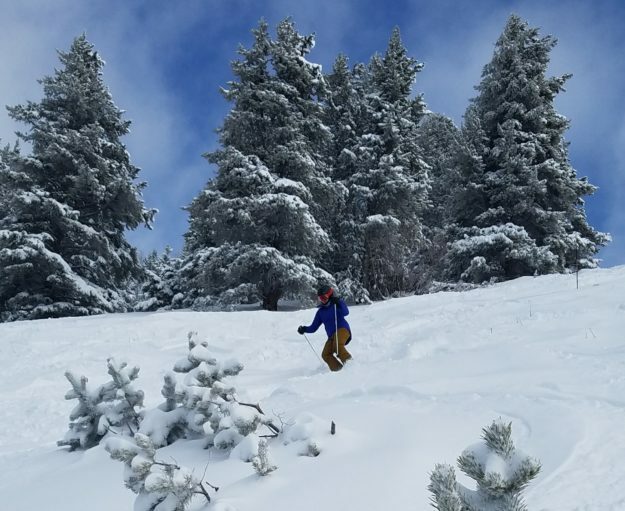 So that big atmospheric woosh heard round the state over the past week — besides coming from all that powder descending on the Vail Valley — was a massive sigh of relief from so many of us dependent on the white gold. It was also heavy breathing from those of us not in ski shape and suddenly confronted with unbroken powder fields in the Back Bowls. That was my situation on Friday, when parts of Sun Up Bowl made a surprise debut and I found myself standing on skis at the top of two feet of untouched snow on Head Wall stretching all the way down to the Chair 9 loading area. Granted, there’s not much base beneath that two feet and lots of long grass was sticking up, but it was was smooth and buttery underneath. My thighs, however, were not in powder-skiing shape. One fairly big powder day over the holiday break up at Whistler (yes, now it’s on our Vail Resorts’ Epic Pass) had demonstrated my woeful lack of ski conditioning. At that point I had more Nordic days in with my dog, and those are not the same muscles. For the last-minute scramble to get in condition for what will hopefully now be a condensed but intense ski season in Colorado, I found this article from Sports Fitness Advisor helpful. And then there’s just the tried and true truism that the best way to get into shape for skiing is by skiing. Problem is, I’m a bit of a powder snob (hence my 1,500-mile drive all the way to the snow-blessed slopes of Whistler). I really only like to alpine ski when the slopes are soft and supple versus hard and unforgiving. So hopefully the snow will continue this week and not really stop until the lifts shut down in April. Forecasters are calling for a much better snowfall pattern the rest of this month.